Central to its provision of health services, IOM endeavors to contribute to strengthening local disease surveillance, early warning and response systems. 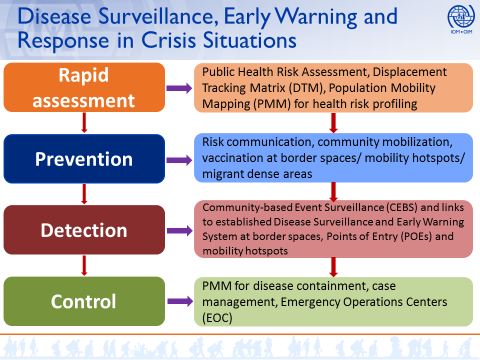 IOM’s clinical data is reported to such systems, and in many locations, IOM directly supports the implementation of Community-event Based Surveillance (CEBS). Additionally, IOM contributes to building the disease surveillance and response capacity of health and non-health authorities, such as immigration authorities, notably at border spaces and migration/mobility affected areas within countries and cross-border. IOM’s approach to responding to disease outbreaks and preparing for future health threats is particularly anchored upon human mobility, notably through the Health, Border and Mobility Management (HBMM) framework.